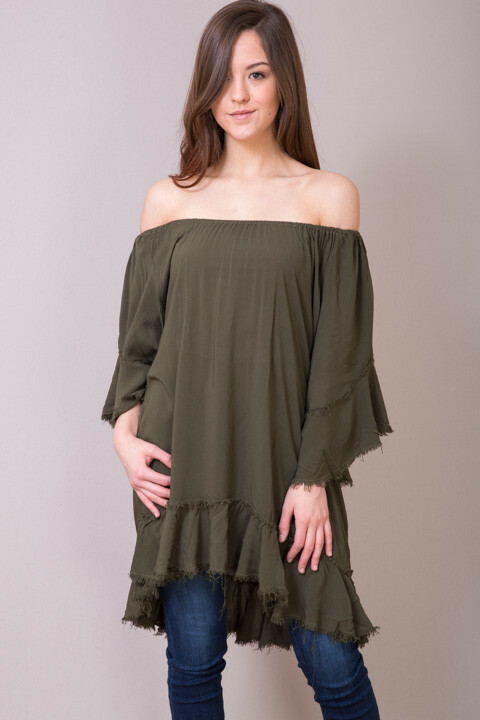 The Calista Ruffle Dress made by Blue Life is a beautiful olive colored off the shoulder shift. This dress features a handcrafted tie dye print and an off the shoulder neckline. There are three quarter length flounce sleeves, and a ruffled raw edge hem. Pair this beauty with wedges or sandals for the perfect carefree summer look. It even looks great paired with your favorite skinnies as a tunic. 100% rayon. Dry clean only.